It’s an interactive, user-friendly web interface, where you can define the data that drive your decision, and the logic that shapes your decision. It’s a cloud-based modeling application: there is nothing to install, nothing to store locally. It’s available on IBM Bluemix cloud, with your Bluemix ID. It’s inspired by the Decision Model and Notation standard (DMN), which is specifically devoted to describing and modeling repeatable decisions. It also benefits from years of IBM expertise in decision management tools. It brings together all important elements to model a decision: input data that drives the decision process, a diagram that describes the high level structure of the decision, business rules and decision tables that define the core parts of the logic. You can test the decisions you’ve modeled. 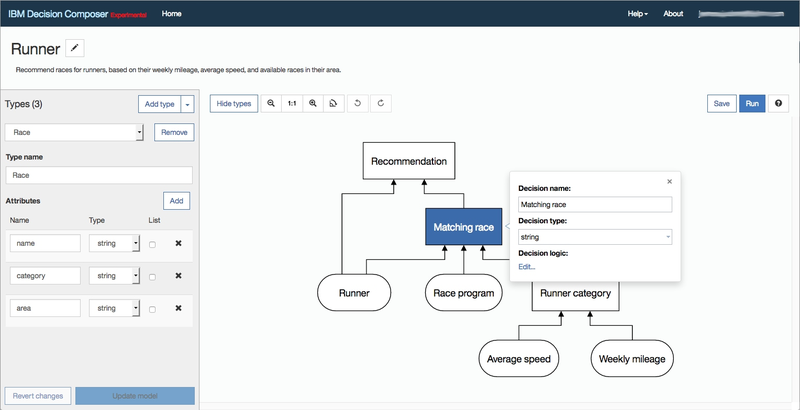 You can submit multiple sample input data and see whether you’re taking the right decisions. You can then deploy decisions on your Business Rules service and process them at a larger scale. Why is this an experimental capability? We often see business analysts willing to use DMN and top-down approaches. We would like to work with them and share ideas about an integrated modeling environment they would love to use. Also, we believe that modeling decisions should be accessible to a wider audience beyond IT. Ultimately, decisions should be in business people’s hands. But, yes, the thought process leading to complex decisions is challenging. With this program, we want to propose new ways and techniques and see how far users can reasonably go. And maybe further simplify the process. This application is available “as is” on Bluemix and accessible from the Business Rules service. Please note that Decision Composer is not a supported tool and must not be used for production. Again, the intent is to gather feedback from the decision modeling community. How to start using Decision Composer? Start a Business Rules service. When your service has begun, you can see a button to launch Decision Composer. Later, when you have authored some decisions, you can publish them to the same service. How to chat, share feedback and ideas? Ask us to invite you to our Slack channel, which is the best vehicle to ask questions, exchange ideas with us and others. Ask your questions on IBM developerWorks. If you want to ask a private question or if you want to engage with us on this topic, just send us a mail.